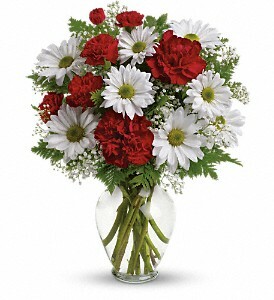 The Kindest Heart Bouquet is a sweet mixture of white daisies, red carnations and baby's breath. 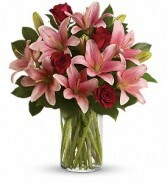 Arrangement is in a clear glass vase. 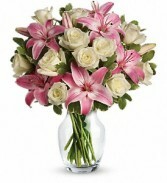 A romantic gesture in flowers. 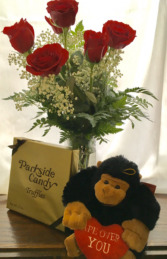 A triple threat sure to bring instant smiles, Six red long stem roses arranged in a glass vase with baby’s breath and greens with an adorable stuffed ape holding a “ape over you” heart along with a box of Parkside truffles.